1. Mix ingredients for pizza dough (garlic salt, flour, water, sugar, and yeast) let it rest for about 10 minutes while preparing the sauce. 2. Mix the sauce ingredients in a sauce pan over medium heat. Bring sauce to a boil uncovered then remove from the heat and set aside. WARNING: once the sauce starts to boil it will shoot tomato sauce all over, you can minimize this by putting a screen over the sauce pan. 3. Arrange charcoal on one side of the grill and light, if using a gas grill only turn on one side of the grill. Once the coals are glowing bright without large flames you can start cooking. You can roll out the dough while the grill is getting ready. 4. Roll out the dough into rectangles that are about 5"x10" and about 1/4"-1/2" thick. 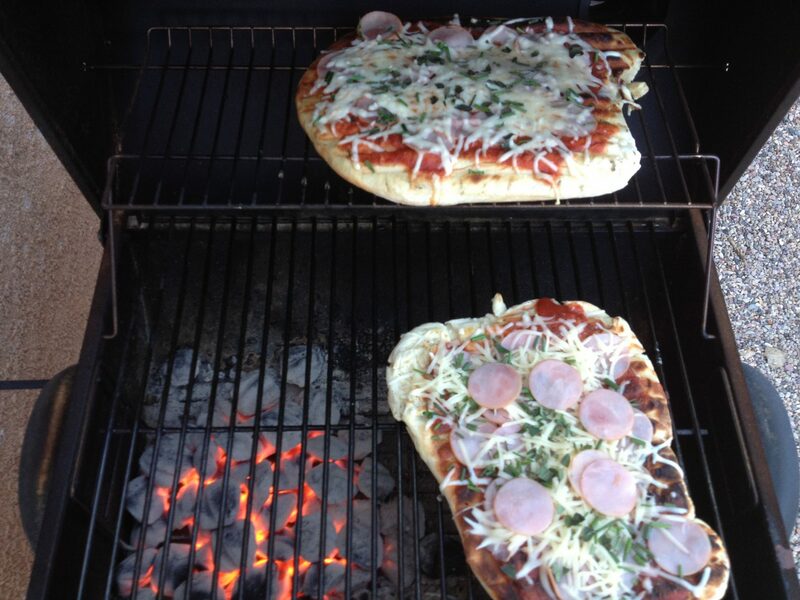 Place the dough on the grill on the side without the coals. Let the dough cook for about 5 minutes, check it a couple of time to make sure the dough isn't burning too much. A few dark spots is fine you just don't want too much blackening. 5. After the five minutes is past flip the dough over and add the sauce and toppings. Let it cook for another 3-5 minutes with the grill lid closed. Check it at 3 minutes to see if the cheese is melted and bottom of the dough is golden brown. Repeat the process until you have made all the pizza you can with the dough you made. It’s hard to go wrong with pizza but when you add a smokey flavor from a grill pizza quickly becomes something beyond amazing. Here’s fair warning, once you try this you may not be able to go back to regular pizza. My grilled pizzarecipe has taken some time to develop I still experiment with different ingredients each time I make it but this recipe will start you off right for your own exploration. It may take a couple of times to get the grill set-up all figured out so your dough doesn’t end up undercooked or burnt but if you have some experience grilling it shouldn’t prove too hard. If you find that the dough recipe makes too much dough for pizzas you can always just grill it by itself brushed with a little butter and sprinkled with parmesan cheese for bread sticks. They’re great dipped in the pizza sauce or ranch dressing.